This past weekend, I attended Divine Play, a three-day-long gathering at the Oregon Convention Center of acro yogis from around the world. Sadly, this is the last year that Divine Play is happening, but I feel so fortunate that I’ve gotten to attend for the past four years and to have this amazing event in my very own hometown! As the name implies, acro yoga is a combination of both acrobatics and yoga and usually involves two people: a base and a flyer. If you’ve never seen acro yoga before, here is just one example of an awesome flow called Ninja Star. There are an endless variety of moves and combinations which would be impossible to share all in one post, but the basic idea is that two people are working together to pull off some pretty challenging shapes with their bodies. I love acro yoga because, just like yoga, it teaches us lessons that can be applied to every area of our lives. In addition, because it involves two people, it has a lot to teach us about relationships, trust, and communication. One of the skills I found myself really focusing on this year was communication. As you can imagine, when you’ve got two people working together to accomplish something that is both risky and difficult, emotions can get heated pretty quickly. As safe as you try to be, drops and falls happen all the time and it can get frustrating when you’re not able to nail the move you’re working on. Often if a move isn’t working, it means either one or both people need to be doing something differently. This is where things can get tricky. Of course it can be helpful to give your partner feedback about what you think they need to do differently, but it can also turn into a blame game where one person is convinced they are doing everything right and it’s the other person who needs to change. Sound familiar? I am guilty of this all the time – accepting that I might be in the wrong is something I’ve been trying to invite more of into my life and it isn’t always easy. We have our thoughts and opinions because we believe they are correct! And when someone else challenges them, our ego can really get upset. In fact, having our beliefs challenged often only serves to convince us even more that we are right. At a festival like Divine Play, you end up working with a lot of different people, many of whom are complete strangers, and it is a great opportunity to practice loving communication. This year, I could feel my ego immediately roaring into action as soon as someone tried to tell me what they felt I needed to do differently. Sometimes it is important to stand your ground and hold onto your beliefs. But it can also be equally important to be open to the idea that you might be wrong. I can’t help my immediate reactions, but I CAN notice those reactions, take a moment to think about whether or not they are really serving me, and THEN choose how to react. When I kept myself open to suggestions from my partners, I was able to try new techniques and improve. Even if their suggestions turned out to be wrong, I learned something from trying them. And giving constructive feedback is just as important as hearing it and taking it in. If you can see that your partner is doing something that is holding both of you back, it’s important to share it in a kind way so that you both can benefit. For some reason, I find this relatively easy to do in acro yoga, but very difficult to do in personal relationships. Why is it so hard sometimes to be honest with people we love? Shouldn’t those be the easiest conversations to have, because we care so much about each other? I honestly don’t know, I’m open to suggestions on this one. 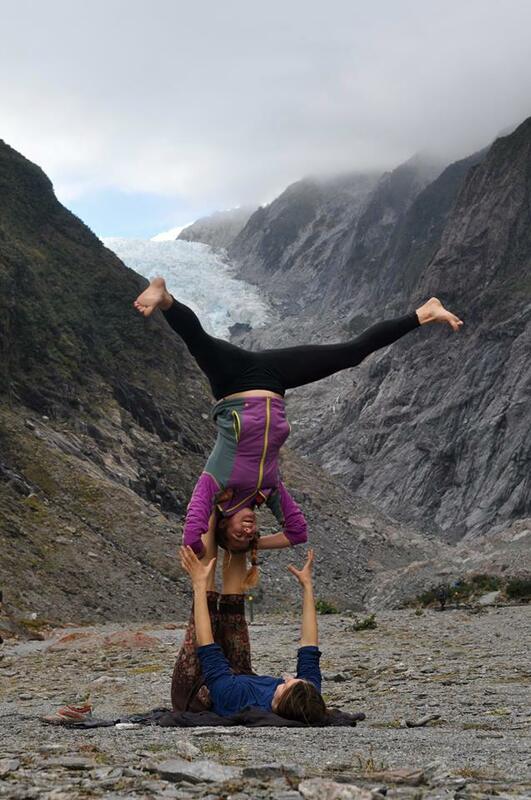 Acro yoga takes a whole lot of trust, especially as a flyer. You are trusting your base to hold you up in the air, often upside-down, and to keep you from hurting yourself when you fall. Of course, the flyer has to also know how to fall in a safe way and to communicate to their base when they think they are about to lose their balance. The truth is, if you are a flyer, you are going to fall over and over again. And if you are a base, you are going to drop your flyer over and over again, and probably get fallen on quite a few times, maybe even stepped on or kicked in the face. It happens! It just comes with the territory. If you’re never falling, then you’re probably never trying something new. So the tricky part is learning to trust people when you know they are going to drop you again and again and working together to make sure that when falls happen, you learn what went wrong and try not to make the same mistakes again. I think this is just a GREAT analogy for personal relationships, both romantic and platonic. Because we all make mistakes, we all fall down, we all say the wrong thing sometimes. When you are interacting with other people who don’t share the exact same brain as you, things are occasionally going to happen that get misunderstood, or taken out of context, or are hurtful. We simply can’t expect relationships to be perfect 100% of the time, so if a relationship is important to us, then we both have to learn to forgive each other for these mistakes and move forward. Now of course, if I had a base that was not only dropping me all the time and didn’t seem to care when I fell, or who occasionally threw me to the ground on purpose, then I would very quickly decide to stop flying with that person. I wouldn’t trust them. The same is true in relationships. I know that all my loved ones are going to mess up from time to time, and I know that I am too, so I do my best to forgive them and I hope for forgiveness in return. But if someone is constantly repeating the same mistake, or making big mistakes often, or doesn’t really seem to care that they made a mistake, well that isn’t really someone I’m going to trust with my friendship or my love. Probably the best thing about acro yoga is the community and how silly they all are. This activity brings together the most amazing, funny, loving, hard-working, playful group of people who are open to meeting new folks, learning new skills, and pushing themselves physically and mentally. People show up to Divine Play in bright colors and colorful leggings, ready to play and learn with total strangers who quickly become close friends. Acro yoga is freakin’ hard and sometimes it’s exhausting and frustrating. But at the end of the day, you just can’t let the so-called failures get you down. Like I said before, if you’re never falling, then you’re not pushing yourself hard enough, and if you’re not having fun, you’re doing it wrong (at least in my humble opinion)! I’ve learned so much from acro yoga over the years and I am grateful for all the beautiful people it has brought me in contact with. Although I go in and out of phases in my life where I do acro yoga regularly, I know it will always be an activity that I enjoy and a great way to connect with people I love, both strangers and friends. If you have never tried acro yoga before and you are the least bit interested, I highly recommend you give it a try! It’s fun, it’s challenging, it’s exciting, it’s a great way to meet people and make friends, and when you finally nail a new move you’ve been working on forever, it’s the best feeling in the world.